"United States troops took over the state government and reinstated the usurpers but the national election November 1876 recognized white supremacy in the South and gave us our state." These words are carved into the base of a monument celebrating white supremacy, near the heart of downtown New Orleans. The inscription is covered with a new plaque, but the monument remains. As civil rights lawyer Mary Howell has noted, this is likely the only monument in the US that celebrates the killing of police officers. However, the New Orleans Police Department has never objected to this monument, perhaps because it celebrates the killing of Black police officers by white supremacists. The “Battle” of Liberty Place was essentially a coup in which the White League of New Orleans deposed the state’s Republican governor by force...the White League in New Orleans organized an impromptu army on the morning of September 14, 1874 to seize the government of Louisiana itself. The battle was reminiscent of the Civil War, with units of the White League engaging a defensive, racially integrated State Militia and Metropolitan Police force. Hours into the fighting, the White League was able to flank their opponents and seize the Cabildo (still the seat of government at the time) and Arsenal. The Republican governor elect, William Pitt Kellogg, and General James Longstreet, commander of the militia and police force in the battle, took refuge in the federal customhouse, a building that the White League was rightfully wary of taking by force. Three days later, federal troops arrived in New Orleans and the White League capitulated. As with the Lost Cause movement’s later reinterpretation of General Robert E. Lee’s surrender at Appomattox, the White League found a way to interpret their surrender to federal forces as a moral victory. The monument was erected in 1891, at a time when the gains of reconstruction had been mostly crushed and white supremacists were in power and celebration. The plaque pictured above was added in 1934. It was not until the 1970s that the city began a push to hide this ugly history, first with the addition of an explanatory plaque, and finally, via the city's first two Black mayors, attempts to take down the monument. In 1981, Dutch Morial, the city’s first black mayor, ran into opposition in his attempt to have the monument taken down and instead had it surrounded by tall shrubs and the 1934 addition covered with a slab of granite. In 1989, street repairs and the construction of a shopping center forced the monument’s relocation to a storage facility, where many in city government hoped to keep it indefinitely. However, in 1991 a David Duke supporter grew impatient with the city’s lack of energy in seeing the monument reinstalled. Since federal funds had been used in the street improvements, the law stipulated that the historic monument be returned to a historically accurate location. The 1991 struggle came at a time when New Orleans Mardi Gras was still officially segregated, before the city council voted to force all white Mardi Gras krewes to integrate. At least two krewes, Momus and Comus, chose to stop parading rather than integrate. Today the monument stands at the corner of Iberville and Badine Street, just a block from Canal and North Peters. 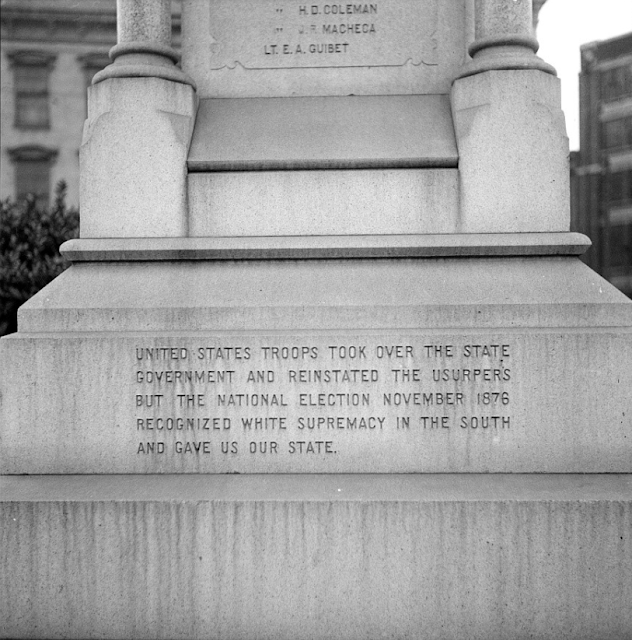 Although the words about white supremacy have been covered, the top of the statue still notes that it commemorates the names of members of the White League. The monument has frequently been the target of graffiti, most recently in 2012, when protestors against police violence spraypainted the names of Justin Sipp, Wendell Allen, and Trayvon Martin. Mayor Landrieu recently said he "believes it is time to look at the symbols in this city to see if they still have relevance to our future." This Sunday, June 28, at 4:00pm, local activists have called for an action called white people against white supremacy (see link for location info). As cities across the US are re-examining their confederate histories, perhaps this monument will finally come down once and for all. Thank you, Jordan, for posting this. I had no recollection about this monument, nor did I know this history.